The progress with which epidemics spread has changed with the way that people travel from place-to-place in modern times. The Institute for Dynamics and Self-Organization of the Max-Planck-Gesellschaft, the University of Göttingen and the University of California Santa Barbara have discovered a mathematical law behind modern movements. In the middle-ages, when people moved only slowly by feet or by carriage, the plague took three years to conquer Europe from the south to the north, with a speed of 2 km/day. Today, as people use a variety of vehicles, planes for long distances, trains, cars and bicycles for middle and short distances, the old model of a wave movement for the spread of diseases doesn’t apply. On the website Where’s George?, established in 1997, anyone can type in the serial code of a dollar note and watch weeks, months, years later, where it has traveled. Already, 50 million notes have been registered. 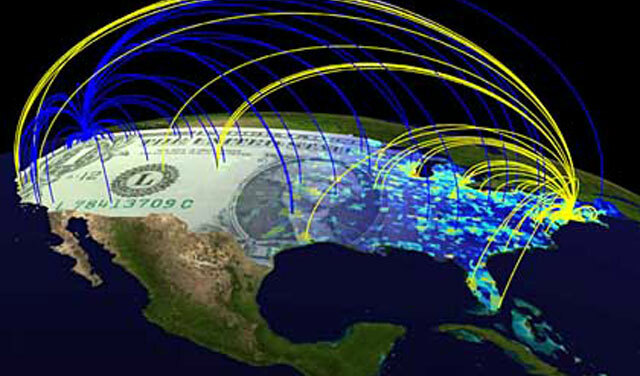 By examining the data of the advances of the dollar notes, a mathematical law behind the travel movements of people has been discovered, which can be applied for the spread of epidemics, and will further enable scientists to predict them. The law is similar to those known from biological and physical chaotic systems. The movements on the map below all took place within one week.